Happy Presidents’ Day (or “Not My President’s Day” for protestors in some cities). George Washington has to share his Monday-convenient birthday celebration with those who followed him, but then again he probably doesn’t care since he’s dead. I’ll have HIStalkapalooza items and the HISsies slides up tomorrow. It’s a bit late to finish up tonight. I feel like trying to read the educational session descriptions in the The HIMSS Resource Guide is an eye test that I failed. The font size is as tiny as the lengthy disclaimers at the end of a credit card pitch. Stymied about which companies are doing something interesting? 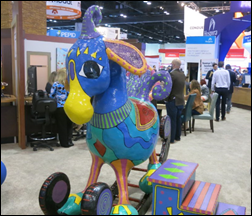 It’s not too late to check out my HIMSS guide of HIStalk sponsors. I was skeptical when someone told me that I should apply the Band-Aid-like product called moleskin to the pressure points of my feet to prevent HIMSS-induced blisters and chafing (of special interest to me since I made the tactical error of bringing a new pair of shoes). Darned if it didn’t work like magic – I just cut it to fit a couple of potential trouble areas and today’s endless walking didn’t bother me at all. 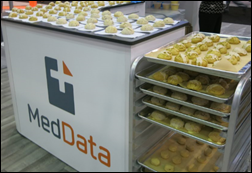 MedData’s scones were outstanding as usual, both the pumpkin and cranberry-orange ones they baked today. InTouch Health had an actual pastry case filled with stuff, although I didn’t sample any. 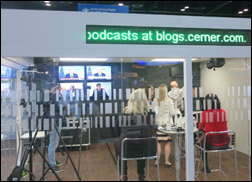 Cerner was doing a podcast with HL7’s Chuck Jaffe when I walked by. The studio was pretty cool, with what looked like live TV news streaming on the monitors (not that we need more of that). 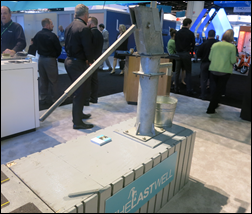 Access brought a huge well to its book to show support for its project to provide drinking water for a Liberian village, which as it notes is a lot more directly life-saving than most of what we do in healthcare iT. Stop by Booth #1778 and you’ll be supporting their cause. 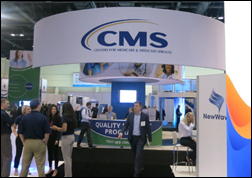 CMS had a big booth. Epic’s art is always whimsical, but this piece had steps that I assume were for photo ops. 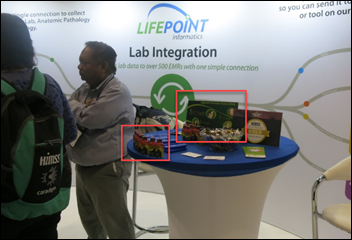 Lifepoint Informatics was giving away energy drinks that were lined up like hyper little soldiers right in front of their HIStalk sign. 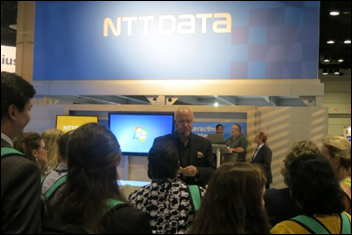 The magnificent psychic, magician, and comic Bob Garner was as entertaining and amazing as always in the NTT Data both. I will definitely see him at least a couple of more times this week. His patter is a bit darker and more daring than that of his contemporaries – I thought the guy beside me was going to bust a gut laughing. 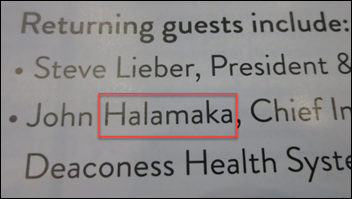 Dear HIMSS-owned publication, John Halamka is one of the most recognizable figures and names in the industry you cover. How did this misspelling not raise an alarm somewhere in the editorial food chain? Yours in news accuracy, Mr. H.
Every year I have to peeve out about this – if you don’t have a clinical degree and an active license, you have no business wearing scrubs in your booth. You’re just annoying people who earned the right to wear them. I’ve noticed that companies increasing mistakenly refer to “digitize” by saying “digitalize.” While the former is specific to computers (finger jokes aside), the latter’s primary definition involves titrating a person on the heart drug digoxin, another of those things that passes marketing muster while eliciting clinician eye-rolling. A fun part of the conference is watching the small-booth vendors getting to know their booth neighbors. Provider attendees don’t realize how actively some companies seek out partnerships during the conference. 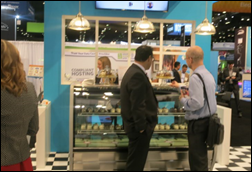 A vendor told me today that they miss the days when the exhibit hall closed for lunch since that’s when a lot of the vendor-vendor networking took place and now it happens in full view of attendees. Some booth notes. Just to recap my method, I travel the hall alone and casually dressed, with a badge title that does not represent me a decision-maker. I also don’t usually engage booth reps since I want to see how they react when I stand expectantly and make eye contact (since not all prospects are going to make the first move). IBM Watson Health had a huge booth and presence at the conference, including giving IBM’s CEO the opening keynote slot (which I refused to attend on principle – vendor executives, especially those with zero healthcare background, don’t inspire me). It must have caused some panicky huddles when the story broke hours before her keynote that MD Anderson’s ambitious and expensive Watson project is in the toilet, at least temporarily. Cerner had a monster of a booth. I was thinking as I passed the Nuance booth that with all the hype about artificial intelligence, it’s now a given that computers can understand what we say with a high degree of accuracy. Imagine how Dragon would look to someone from the 1970s. A vendor told me that just the light box for their modest-sized booth (the big rectangular sign that hangs above in their air space) costs $20,000. Their three-day exhibit expenses will be $200,000. They estimated that Cerner and the other big-booth vendors must be laying out $3-5 million to exhibit considering all the people they bring. Georgia from Salesforce gave me a quick overview of the physician relationship part of Health Cloud. I pledged to walk away from any vendor whose signs or patter include making a FHIR-related pun. The exhibit hall appears to end in the 6700 block, but it actually keeps going into the 9000 range, with various non-vendor exhibits mixed in. HIMSS is so big that some exhibitors get stuck in no-man’s land where foot traffic is sparse and I’m afraid some of the vendors on that side are feeling left out of the action. Some nice Healthwise folks said it’s different working with clients in Canada because they are more focused on social determinants of health and other factors that impact public health beyond just doctoring people up in the Jiffy Lube model of US healthcare. SPH Analytics hires Amy Amick (nThrive) as CEO. Should anybody be wearing scrubs in a booth, regardless of professional qualifications? Are they expecting “splatter” that they don’t want to get on their clothes? On a more serious (and topical) tip though: I’d love to hear more about the conversation you had with the folks from Healthwise, and their observations on approach to patient care from the Canadian perspective. After a great presentation on the VA’s joint viewer project I visited a demo that featured Epic, Cerner and Siemens Healthineers. The Epic presenter’s monitor was set to a slide show that replayed the same competitive messaging from their booth on a loop. Maybe I’m naive, but it seemed to be in poor taste given the showcase is built for vendors to demonstrate their collaboration and commitment to bettering our industry. For their end of it, the Cerner and Siemens reps were unarmed – no fancy screensavers – you only saw a HIE diagram and a patient portal UI. Regarding the Korean Best Care HIS, they were passing by to HIS vendors booths taking material and attending demoes as well as taking notes. Not that will make them better but it is just the ethicality of it. In Saudi Arabia where they partnered with the National Guard hospitals, Best Care team went into cerner lab application and make an exact copy of the software. Next year they will be replacing cerner lab at national guard. Epic dropped north of $6 million on the conference in total projected spending at HIMSS all-in. I’d venture the booth and print materials were probably about 50-60% of their total costs.